As a part of the #HumanMOOC, Jim Groom, the director of teaching and learning technologies at the University of Mary Washington shares his story about how he has used triggering events in #DS106. We were thrilled to get to hear the story of the Summer of Oblivion. It sounded like it was fun and when instructors have fun teaching and the students have fun learning, the experience can be transformative and lead to deeper learning. If you don’t know #DS106, it is a digital storytelling course at the University of Mary Washington. The experiment was to have Jim become Dr. Oblivion from VideoDrome. Who says that “The television screen is the retina of the mind’s eye. Therefore, the television screen is part of the physical structure of the brain. Therefore, whatever appears on the television screen emerges as raw experience for those who watch it. Therefore, television is reality, and reality is less than television.” Jim says that he was struck by the notion of taking on this persona and attempting to be focused on being this other character. He struggled with the identity after three days of the hour long lectures, he had an identity crisis. He talked with his co-faculty and they suggested that Dr. Oblivion disappear. 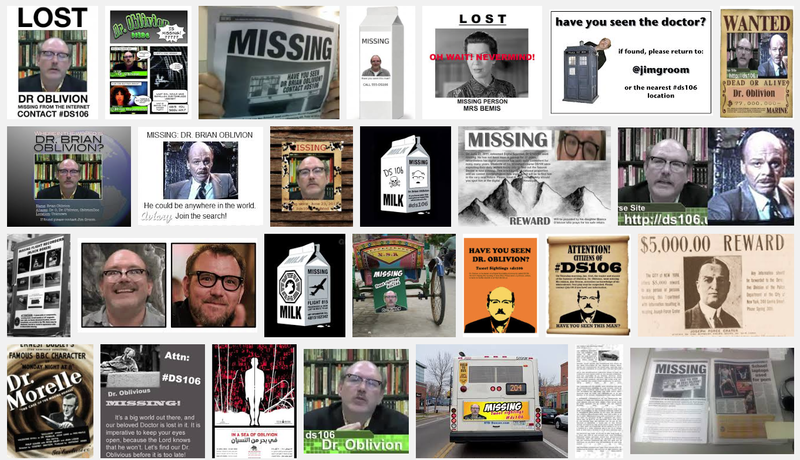 The missing persons narrative took hold when Dr. Oblivion went missing. And, the students began to drive the narrative through their creations. Jim plays the part of the Teaching Assistant who goes mad with power and banishes students from the course which prompts the rise of #ds107.